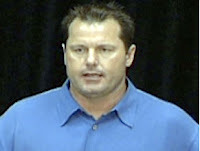 Speaking to what looked like a catcher’s mitt but could have been 60 Minutes reporter Mike Wallace, Roger Clemens, a 46 year-old man who throws a baseball in the low to mid 90’s on a consistent basis, denied he took steroids Sunday night in a televised interview. The next day, dressed in a blue shirt, he had a weird press conference in which he played an audiotape of a phone conversation with the man who has accused him of taking steroids, Brian McNamee who’s son is apparently gravely ill. In both instances the only one saying that Clemens did not take steroids, was Clemens. Clemens, who chose Wallace to meet with because he wanted to talk to someone close to him in age, and also because he feels comfortable dealing with catcher’s mitts, admitted playing the McNamee phone call to “make everyone feel uncomfortable”. Reaction to Clemens’ possible steroid use has been mixed with many baseball fans being extremely disappointed by the 7 time Cy Young Award winner but the vast majority of “bizarre pubic meltdown” fans remaining thrilled.